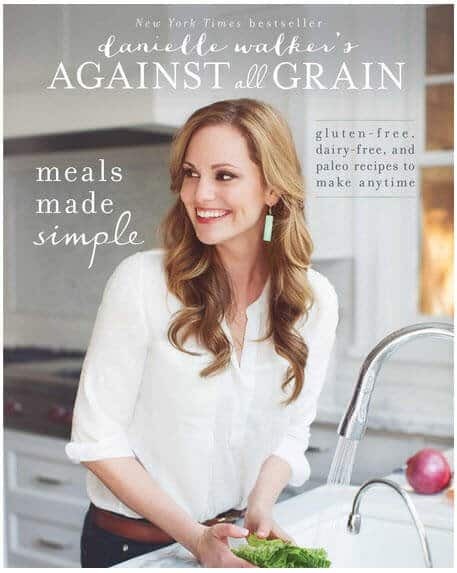 Danielle Walker’s Against All Grain: Meals Made Simple is a cookbook designed for those following a paleo diet and includes recipes that are free of gluten and dairy. People who are lactose intolerant or have gluten sensitivity can also benefit from these diverse recipes that are simple enough to make for a weekday meal when you are in a time crunch. This unique cookbook includes 8 weeks of meal planning ideas to take the guesswork out of trying to shop for and prepare food in a grain free/dairy free household. You will get recipes to use with your slow cooker or to prepare all in one pot. 30-minute meals make it even easier to eat healthily and stay within a paleo diet despite a busy schedule. Leftover meal ideas are possibly one of the best additions to the book and help to cut down on cooking time, food waste and the boredom that can come when you are stuck just reheating the meal from the night before. There is also a Paleo Cheat Sheet, a glossary of cooking tools and other resources to make shopping and prep easier. Author, Danielle Walker came to be an expert in healthy cooking for those with the autoimmune disease after she, herself, was diagnosed and spent many years in and out of the hospital before learning to treat herself with food instead of medication. This cookbook helps you get the most out of the lessons Walker has learned on her way to health and will help many who want or need to avoid gluten and/or dairy. This book is especially good for those who are new to paleo and gluten-free because of the addition of basic recipes like cauliflower “rice,” squash “noodles,” and homemade mayonnaise. Ideas like these are not new but should be any paleo dieter’s recipe wheelhouse. The Kitchn.com says: “Beautifully presented and clearly explained, Meals Made Simple is a delight for Paleo newbies and long-term Paleo-its alike.” The review goes on to say that “the recipes can get pricey” because of how much meat and fish are used. So, this is not for budget-conscious gourmets or anyone who would like to go vegetarian. While there are plenty of basics and recipes that are naturally gluten-free in the book, there is enough variety for it to be a welcome addition to longtime paleo dieters with recipes for things like no-cook chocolate pudding. The meal planning guide, tips for shopping quickly and paleo cheat sheet add value to this book that does center on fairly basic recipes.